Thirty-four percent of service department customers prefer to communicate via text message, but service departments only communicate that way 9 percent of the time. That is according to the J.D. Power 2019 Customer Service Index Study, released on Thursday. The study shows that satisfaction scores usually increase when car dealership service departments use customers’ preferred methods of communication. But J.D. Power vice president, U.S. automotive retail practice Chris Sutton says service customers want the convenience of technology. Sutton sees no reason why more service departments don’t communicate by text. For owners and lessees of 1- to 3-year-old vehicles, the study measures satisfaction with service at a franchised dealer or independent service facility for maintenance or repair work. It also ranks the highest-performing U.S. automotive brands, and that is based on the combined scores of different measures of the vehicle owner service experience. These measures are service quality, service initiation, service adviser, service facility and vehicle pick-up. Satisfaction is 75 points higher (on a 1,000-point scale) among customers who have an all-digital experience compared with one that is all analog. Those customers want to use the internet and communicate with the dealer through text messages, rather than over the phone. If the service adviser uses a tablet, that only further increases satisfaction. The survey is based on responses from 57,286 owners and lessees of 2016 to 2018 model-year vehicles. It was fielded from October through December 2018. The study showed even more results proving customers’ preference for communicating through technology. All generations show a preference for internet scheduling rather than over the phone. That is a major shift since 2015, when the industry average preference for these two methods was 20 percent for the internet and 64 percent for the phone. This year, preferences are 28 percent for the Internet and 59 percent for the phone. Gen Y customers have shifted their preference toward internet scheduling at a faster rate than Boomers. However, every generation except Pre-Boomers has increased its preference for internet scheduling and decreased its preference for phone scheduling during the past five years of the study. J.D. Power defines the generational groups as Pre-Boomers (born before 1946); Boomers (1946-1964); Gen X (1965-1976); Gen Y (1977-1994); and Gen Z (1995-2004). —In-store engagement is important: The percentage of customers who feel their service adviser provides helpful advice is 70 points higher when the adviser was focused on them and their needs during the visit. Other factors boosting a customer’s view of the service adviser’s perceived helpfulness include informing customers about work performed on the vehicle, knowing the vehicle’s service history, keeping them informed of the vehicle’s status, letting them know when the vehicle will be ready before service begins and performing a vehicle walk-around. —A large percentage of owners are also promoters: The 2018 study introduced Net Promoter Score, which measures customer loyalty and predicts business growth. The score continues to show that many owners are promoters of their vehicle, although the percentage decreases slightly as vehicles age. Customers are asked their likelihood of recommending their vehicle model and are grouped into either the detractor, passive or promoter categories. More than three-quarters of owners are promoters in year one of vehicle ownership; 75 percent are promoters in year two; and 73 percent are promoters in year three. However, when an owner’s vehicle is not fixed right the first time, Net Promoter Score drops about 50 points (on a 100-point scale). —Independent facility satisfaction gaining ground: Overall satisfaction with services performed by independent facilities has improved 22 points since 2017, compared with a 17-point improvement by franchised dealers. Satisfaction with service quality at independent facilities has improved 23 points since 2017, compared with a 17-point improvement by franchised dealers. Sutton says the key performance indicators of service are “an important area of opportunity for dealers.” Simple tasks such as completing service right the first time, returning settings to where they were when the customer brought the vehicle in for service and washing the vehicle can affect customers’ perception of service quality, he added. The survey also showed the highest-ranking brands, and for the first time in the study’s 38-year history, Porsche ranked highest in dealer service satisfaction among luxury brands. Lexus ranks second, followed by Cadillac, Infiniti and Mercedes-Benz. For the third consecutive year, Buick ranks highest in satisfaction with dealer service among mass market brands. MINI ranks second, followed by Mitsubishi, Chevrolet, GMC and Toyota. Auto Remarketing recently hosted a free educational webinar with Podium that focused on the possibilities of text messaging at the dealership. The session titled, "7 Ways Text Messaging Will Boost Your Dealership’s Bottom Line," is available here or through the window at the top of the page. With an appointment the company says indicates a culture committed to diversity and inclusion, Cox Automotive’s Dealertrack appointed Mandi Fang to vice president and general manager of Dealertrack DMS. Fang is a Cox Automotive and industry veteran that the company says brings more than 15 years of executive leadership experience in the automotive retail industry to her new role. That experience includes product management, innovation, sales and management of strategic accounts. But Fang is also known as an influential women’s leader in the industry. She has served as a member of the Women in Tech Council and Women in Automotive. 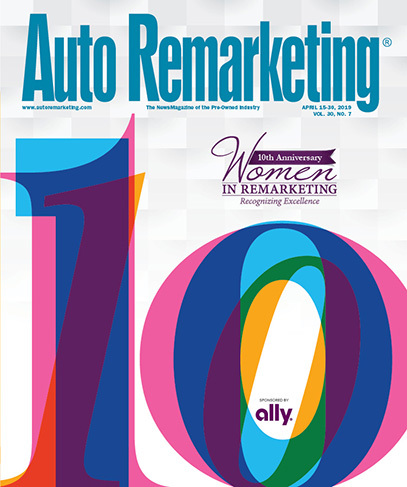 In 2016, she was listed as one of Auto Remarketing’s Women in Remarketing, and she received the Spirit of Leadership Award from Women’s Automotive Association International. In her new role, she will oversee Dealertrack’s DMS business as the brand continues to develop services that the company says are important in helping dealerships adapt to shifting consumer expectations. Fang most recently spent five years in product management, leading the development of Cox Automotive’s new and used vehicle inventory management, merchandising, and DMS services for dealers and OEMs. She holds a bachelor’s degree in communications from Morehead State University. Fang keeps busy outside of work, as well, volunteering at INN Between, Hospice for the Homeless and Best Friends Animal Society. DealerTrack notes that its its culture of diversity and inclusion has contributed to the company’s success. For the second consecutive year, Dealertrack DMS has been named to the Women Tech Council’s 2019 Shatter List, which highlights companies that make an impact toward more gender-inclusive cultures that help advance women in tech. Finding the right dealership can make or break the car buying experience. So says Edmunds chief executive officer Avi Steinlauf. “Our latest Five Star Dealer list is a great starting point for shoppers on the hunt for a local dealer that shares our commitment to superior customer service and support, and we’re honored to support their willingness to go above and beyond for their customers,” Steinlauf said in a news release. Edmunds has announced the winners of its 2019 Edmunds Five Star Dealer Awards, and they include 177 dealers nationwide with top customer satisfaction ratings. The awards are based on sales reviews from Edmunds car shoppers. An additional 14 of the highest-performing dealerships have earned Edmunds’ Five Star Premier Dealer designation. To be eligible, dealers must participate in the Edmunds Dealer Partner program. They also must have received at least 30 sales reviews on Edmunds during calendar year 2018. Five Star Premier dealers must have received at least 150 sales reviews on Edmunds in 2018. Edmunds Five Star and Edmunds Five Star Premier dealers must have earned an average customer sales review rating of at least 4.5 stars between January 1, 2018 and December 31, 2018 to qualify. To find the full list of 2019 winners can be seen at the Edmunds Industry Center. Edmunds Five Star Dealerships are organized by state, so residents can find their state’s local winners more easily. Car shoppers can look up the reviews and ratings for any dealer in their area on Edmunds’ Find a Dealer page. The 2019 Five Star Dealer badge denotes the winning dealerships. Automotive merchandising software company SpinCar has launched a new tool that it says could help dealers and OEMs increase gross margins by showcasing the key features and options included on their vehicles. SpinCar explained the new tool — Feature Tour — replaces static vehicle detail page feature lists with customizable multimedia experiences based on a consumer’s self-identified interests. Because the product highlights the most relevant features and options of a particular vehicle, dealers can help shoppers understand the inherent value of that vehicle, according to SpinCar. The company added that by using the tool, consumers can make more accurate product comparisons and can provide “tangible justification” for a dealer’s published price. Feature Tour content is currently available for more than 450 features across 18 OEMs. Why did SpinCar launch the tool? The company indicated that complex features and capabilities of today’s vehicles can be difficult to explain. Especially in a mobile-first world, long lists and descriptions included on traditional VDPs do not inform and educate online shoppers well, SpinCar added. Because of that situation, many consumers must leave a dealer’s website to conduct additional research, and other consumers use price rather than features in their decision-making when comparing vehicles from different retailers. That has contributed to lower dealer gross margins, according to the company. To address those challenges, Spin Car highlighted Feature Tour can bring curated videos, images and explainer content directly to consumers while they explore the vehicles on a dealer’s website. By showcasing the unique features of a vehicle that are most relevant to each shopper, SpinCar’s proprietary multimedia personalization engine can educate consumers. “While OEMs continue to enhance vehicles with a broad assortment of sophisticated, technology-enabled features, dealers are finding it harder and harder to communicate the value of these new capabilities to online car shoppers,” SpinCar co-founder and chief executive officer Devin Daly said in a news release. Dealers can use SpinCar’s cloud-based software platform and database of OEM-endorsed content to automatically add a Feature Tour to any vehicle detail page. Then, online shoppers visiting those VDPs can access a guided, virtual walk-through of the vehicle’s key features and options. Users can customize their Feature Tour based on self-identified areas of interest such as safety, performance, technology or convenience. Or, users can review all of a vehicle’s key features. Feature Tour then can capture information regarding the shopper’s preferences and interests and suggests other vehicles with similar features. The system also can facilitate more personalized follow-up communication from the dealer. “SpinCar’s digital merchandising platform has already made a measurable impact on our business by bringing shoppers to our website and keeping those shoppers engaged longer,” AutoTrust USA dealer principal Gary Pretzfeld said in a news release. Shoppers who are more knowledgeable of the specifics of each vehicle will be able to make faster and more confident buying decisions, he added. Through the end of March, qualified shoppers can get a certified pre-owned GMC Acadia or Terrain with 1.9-percent interest for up to 36 months. Autotrader describes that as one of many strong offers that automakers and dealers will be rolling out as they gear up for one of their prime selling stretches of the year. Warmer weather is coming, and that could mean more warmth from dealers that are ready to drive sales. Car shoppers during this time should potentially check out certified pre-owned vehicles, which Autotrader says is part of a growing market in recent years. Autotrader editors say the following deals can help shoppers in March find a certified pre-owned vehicle that is best for them. In addition to the Acadia and Terrain mentioned earlier, GMC's certified pre-owned program offers six years or 100,000 miles of powertrain coverage from the original sale date, according to Autotrader, and that includes an extra year of comprehensive warranty coverage. For Jaguar's certified pre-owned program, the automaker is offering qualified shoppers 0.9-percent interest for up to 24 months through the end of March on all CPO 2017 F-Pace models. Drivers can also get 3.9-percent interest for up to 36 months. Jaguar offers comprehensive coverage for up to seven years or 100,000 miles from the original sale date. Lincoln's certified pre-owned program offers up to seven years or 100,000 miles of powertrain protection, plus an additional year of comprehensive coverage over the standard factory warranty, according to Autotrader. But Autotrader adds that Lincoln’s CPO program is available with another “alluring benefit” that could give cost-conscious shoppers a reason to consider a luxurious Lincoln model: That benefit is 2.9 percent interest for up to 72 months on all Black Label models. Aside from Black Label, 4.75-percent interest is available on other Lincoln models for up to 66 months. Mazda offers powertrain coverage for up to seven years or 100,000 miles from the original sale date as part of its certified pre-owned program. That includes one-year extension of the bumper-to-bumper warranty. Mazda is enhancing its CPO warranty in March, with a special offer of 0.9-percent interest for up to 36 months on all CPO models to qualified shoppers. Automakers’ and dealers’ commitment to CPO in March includes the Mercedes-Benz certified pre-owned program. The current program offers one year of comprehensive coverage with no mileage limit, and buyers can pay an extra fee to extend that coverage for additional years. In March, Mercedes-Benz shoppers will see several incentive offers for certified pre-owned vehicles. They can pay 1.99-percent interest for up to 36 months on many CPO models, and that includes popular vehicles such as the CLA, the GLA, the C-Class, the GLC, the E-Class, the GLE, the S-Class and the GLS. Subaru's certified pre-owned program offers coverage that lasts for seven years or 100,000 miles from the original sale date, but the program doesn't offer any additional comprehensive warranty coverage. “That’s forgivable this month,” Autotrader writes, noting that through the end of March, qualified shoppers can get 1.99-percent interest for up to 36 months on all certified pre-owned Subaru models. Autotrader notes that is “an excellent deal” on a pre-owned vehicle. Autotrader writes that Toyota's certified pre-owned program is strong, featuring one year of comprehensive coverage along with the standard warranty coverage and seven years or 100,000 miles of powertrain coverage. In March, qualified CPO Camry or Corolla shoppers can get 3.9 percent interest for up to 36 months. Autotrader believes that is a strong deal as interest rates rise. Different Volkswagen certified pre-owned vehicles receive different coverage, but buyers can add an additional two years or 24,000 miles to their factory warranty. Shoppers can get a better deal than usual on a CPO Volkswagen in March, according to Autotrader. Qualified shoppers can receive 3.99 percent interest for up to 60 months, which Autotrader says is a desirable long-term deal for a pre-owned car. Long gone are the days when rows of racks with glossy vehicle brochures filled dealerships' showrooms. Shoppers often find information via mobile devices or what’s being offered by companies such as RelayCars. RelayCars, a company that provides the virtual reality automotive experience designed to put consumers in the driver’s seat of thousands of vehicles, recently announced the expansion of their VR suite of applications with the launch of the new RelayCars, now in roomscale. The company explained roomscale can allow users to move freely and naturally around the virtual showroom while customizing car options and researching their next vehicle. Furthering the future of vehicle research and shopping, this technology can give consumers a more efficient way to shop for cars that may not physically be on the dealer lot or even browse from the comfort of their homes. Officials also emphasized dealers will now have the ability to instantaneously showcase a wider range of vehicles and help consumers to make informed purchasing decisions through the realistic environment. RelayCars in roomscale is available via digital distribution platform, Steam. While wearing a headset, shoppers and dealers are able to select vehicles from the expanding model selection and place them in one of three designated spaces on the showroom floor. Users can interact with the environment and the showcased vehicle models to view them from any angle, change the vehicle color, enter the interior, step back to check out the vehicle in full, or walk right up to the vehicle for a more in depth look at the design and detail. “This is the first time we are offering our users the opportunity to walk around their customized virtual showroom to observe, compare and interact with the vehicles on another level,” RelayCars chief operating officer Gina Callari said in a news release. “The technologies enabling virtual reality are evolving at such a pace that being able to provide more interactive and realistic experiences for our customers is of the utmost importance to us at RelayCars,” Callari continued. RelayCars in roomscale is available on Steam supported VR headsets including Windows Mixed Reality, HTC Vive and Oculus Rift. For more information about RelayCars, visit www.relaycars.com. A new version of a lead generation system improves dealer autonomy in operating the system, and it provides new collaboration with various lead sourcing tools. Reynolds and Reynolds vice president of product planning Jon Strawsburg said in a news release that the company's new version of XtreamService gives dealers the power to manage XtreamService campaigns hands-on and create campaigns, analyze reporting, and adjust parameters themselves. XtreamService generates what the company describes as highly qualified leads through an advanced predictive analytics engine using consumer behaviors, equity analysis and demographic data. The software behind XtreamService uses statistical modeling, machine learning and artificial intelligence to anticipate buyer behavior, according to the company, which added that the product delivers accurate sales recommendations for dealerships. The lead-generation software works as one with Reynolds Contact Management, a web-based customer relationship management system, and DigiSales, the mobile application from Reynolds for Contact Management that enables sales staff access to information such as customer data and vehicle inventory. Car Wars and VinSolutions say their improved integration brings enhanced lead management capabilities to dealers that use VinSolutions Connect CRM and Car Wars. The Car Wars dealership call-tracking software automatically attaches a recording of every outbound sales call to an existing customer record in Connect CRM. The Car Wars tool attaches call recordings to Connect CRM customer records. It also generates and attaches written call recaps. Because that streamlines workflow, according to the companies, dealership staff does not have to listen to every call to personalize customer interactions. That automation helps to streamline productivity for BDC agents, salespeople and management teams, according to the companies. It provides lead management capabilities in VinSolutions’ platform. Connect CRM is the main day-to-day activity hub for many dealership staff, and the new integration provides pre-authenticated, direct access to Car Wars reporting and insights. The companies add that a streamlined click-to-call workflow will make tracking every outbound call between the systems easier. That allows sales agents to work out of customer records in Connect CRM with a holistic view of each customer’s interactions and call history. When salespeople have such a complete understanding of a customer’s interactions with a dealership, the salespeople can improve the customer’s experience, according to the companies. Lori Wittman, general manager of VinSolutions and senior vice president of dealer software solutions at Cox Automotive, emphasized in a news release the importance of a personalized connection between dealers and customers. VinSolutions is a Cox Automotive brand. VinSolutions will also implement Car Wars’ new communication dashboard, Call Box, at its contact center. With the new system, users will be able to click directly into a customer record in VinSolutions Connect CRM while on a live call, and they can use “click-to-call.” The companies say Call Box allows real-time insight into calls before and as they’re happening. Marking its eighth market in Ohio, e-commerce platform Carvana launched in Dayton. The move continues Carvana’s recent flurry of launch activity. The company announced in February that it opened in its 100th market— in Savannah, Ga. — as well as in five Northeast markets. Prior, in January, it announced it was launching in five New York markets and in Columbus, Ga.
With the latest Dayton announcement, Carvana now offers as-soon-as-next-day vehicle delivery in 102 cities nationwide. Carvana founder and chief executive officer Ernie Garcia said in a news release the company has steadily increased its Ohio presence since 2016, and the company has more locations in Ohio than any other state. Carvana was founded in 2012. “As the birthplace of aviation, Dayton has deep technology and innovation roots, so we are confident area residents will welcome the new way to buy a car,” Garcia said. It was the last quarterly earnings call in which Mike Jackson will be the sitting chief executive of AutoNation, but not one without the usual candid, opinionated and ultimately insightful commentary from the longtime CEO. During the Q&A portion of the February call, an analyst encouraged Jackson to remain a “vocal” presence in the car business. “Oh yeah, yeah. Call me up, and I’ll have an opinion or two,” Jackson said in response. Later, his thoughts regarding the potential impact of tariffs on vehicles imported to the U.S., proposed by President Donald Trump, were similar in candor. “Auto tariffs will make the steel and aluminum tariffs look like a picnic,” Jackson said. “They will be very disruptive to the auto industry and probably knock the global economy off its stride significantly … they’re so disruptive, it’s almost unthinkable,” he said. “I think it’s all about leverage and brinkmanship in a trade negotiation, and at the end of the day, it’s mutual destruction to implement tariffs of these levels on autos,” Jackson said. “Let alone the fact that there’s no underlying authority that’s justifiable to do it. “That it’s a national security issue when the U.S. auto industry is healthier than it’s been in decades is a stretch. But, OK, let’s not let any facts or clear thinking get in the way,” he said. You can be sure Jackson will be paying attention to — perhaps offering entertaining commentary himself — the potential impact of auto tariffs and how other economic issues play out in the auto reail industry, albeit from a new role. As reported previously in Auto Remarketing, AutoNation is set to usher in a new chief executive officer and president on Monday. The retailer announced in February that current USAA chief operating officer Carl Liebert would replace Jackson as president and CEO; Jackson will take on the position of executive chairman of the board that same day. “AutoNation has a clear strategy that sets it apart in the auto retail sector and diversifies the typical retail business model. The company’s brand extension strategy has given it an edge in what is a cyclical business,” Liebert said in a news release. The vote by the board to name Liebert president and CEO was unanimous, AutoNation said, and was “fully” supported by the two largest shareholders in the company, Cascade Investment and ESL Investments. In addition to time as chief operating officer and executive vice president at USAA, Liebert’s experience also includes time as the executive vice president for stores at The Home Depot, and he is a former U.S. Navy Officer, as well. During the earnings call, Jackson explained a bit about AutoNation’s process of finding his successor. The company, of course, had specific criteria for the new CEO. Liebert has shown that he can enter industries that are new to him, “and master them,” Jackson said. The incoming CEO has experience in retail at scale, and “you really can’t reach that,” Jackson said. “He’s an operator, and we are an operating business. That’s a strength we need. And he has a tremendous respect for operations,” Jackson said. “Then I look at our brand extension in parts. We need world-class skill in supply chain logistics. Lastly, Jackson emphasized the digital platform savvy of USAA, which has nearly 13 million members utilizing the digital platform — one that is mostly mobile-based, he said. “So we found it all in one individual, and then lo and behold, the icing on the cake is that he’s a car guy,” Jackson said of Liebert, who interestingly enough, was an announcer on the drag racing strip growing up.